Russell Wilson’s play date with the Yankees is a big reminder that most pro athletes are just transplants, on paid loan to the sports city in which they play, and have no loyalty to that city beyond the team they play for. And sometimes not even then (ahem, Earl Thomas). Seeing Wilson in a Yankees jersey is galling to Seattle fans who cheer both the Seahawks and Mariners. But we all have to remember Wilson is not from Seattle. He is from Wisconsin, by way of North Carolina, by way of Virginia — all a bunch of places that have nothing in common with Seattle. And his dad was a big Yankees fan. As annoying as it is to Seattle sports fans, this is just the fulfillment of a pre-Seattle dream for Wilson. Marshawn Lynch won’t be seen on the field tonight, but we sure have been seeing a lot of him on TV recently as he takes advantage of his newfound commercial appeal. As he misses a game for the first time since 2011 — and just the second time in his five years with the Seahawks — we thought we would recap his latest commercial ventures so you didn’t miss him too much. First, from August, there was the Skittles infomercial in which “Big Daddy” and Skittles got engaged. It’s vacation time for the NFL, but on Monday the Seahawks hogged the sports spotlight as three of their top players talked about their contract situations and more. While Michael Bennett babbled more nonsense about holding out, Russell Wilson made it clear he will show up no matter how much he is making. 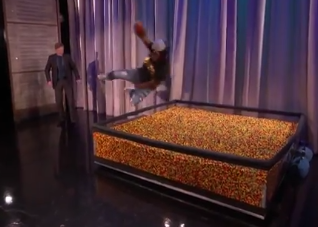 And then Marshawn Lynch finished the day with another hilarious appearance on “Conan,” saying (among other things) the $12 million the Hawks are paying him this year was a good reason to put off retirement. The Seahawks are having a good time bonding on Maui (my favorite vacation spot). Russell Wilson has been joined by 20 teammates, including new additions Jimmy Graham and Cary Williams and all of the team’s starting linebackers. The other players in attendance, according to Seahawks.com (and photos): tight ends Luke Willson, Cooper Helfet and RaShaun Allen; wide receivers Doug Baldwin, Jermaine Kearse, Kevin Norwood and Chris Matthews; running backs Demitrius Bronson and Derrick Coleman; cornerbacks Richard Sherman, Eric Pinkins and Will Blackmon; linebackers Bruce Irvin, Bobby Wagner, K.J. Wright and Mike Morgan; safeties Kam Chancellor and Dion Bailey. Not surprisingly, Marshawn Lynch is not there. The guy’s a maverick loner, as we all know. Not sure why Robert Turbin and Christine Michael are not there. Earl Thomas, Paul Richardson, Jeremy Lane and Tharold Simon are recovering from surgeries.